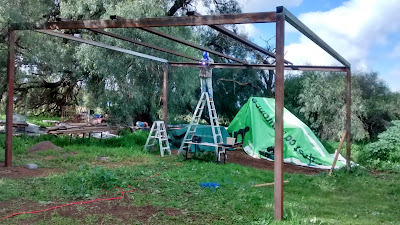 So, a friendly electrician took pity on us and took a look at our setup, and we're hoping he's able to help us out. 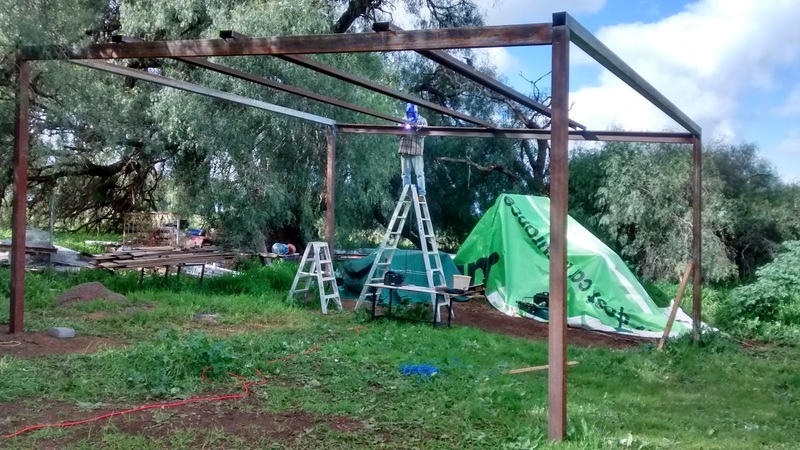 In the meantime, when the weather allows, we've continued to practice welding by putting up the shed. It's been fun, frustrating and exciting, all in the same day sometimes. We're both getting better at welding, and I'm pretty sure it won't fall down.. Mostly pretty sure. After all, when it's done, we're going to park the tractor and the cars under it! Yikes. We've had some lovely rain, the wattle trees are blooming, and so are the almonds. The chooks have been amazing, too. They're laying enough to keep us with 2 dozen eggs at a time in the cupboard, and a few more to give away occasionally. They're out scratching around in the cold, from just before dawn to a little before dusk. The naked-neck breed is the work-horse of the chook world, I think, followed closely by the langshan. The dorkings are a bit more laid back, but it'll be interesting to see how the next generation fare, given their role models! I can't wait until we get a broody hen!! It's nearly the end of winter, and we're scaling back our heater usage now. For a while there the Nectre 15 was running 24 hours a day. Now it's only really in the evenings, except for the odd 10°C (50°F) rainy day, when going outside just isn't going to happen. The wood we stored is getting a little low, but we'll make it through with spare.